A $100,000 grant has been awarded to American River College by Makerspace, a collaborative effort throughout the country to establish spaces for communities where something can be made out of nothing with a variety of technology: 3-D printers, laser cutters, computer-automated machines, soldering irons and even sewing machines. ARC and the Design Hub’s head, professor Randy Schuster, have decided to apply the grant to a more ambitious vision—with dozens of projects already lined up. They are putting the money toward paying internships in their program and the maintenance of machines, and are using their resources to create a space in which students and interns can create what the college needs. These things range from models of human or equine bones and wire tension testers to a robotic aid with a Skype interface for a face, which representatives from other colleges will be able to use to talk with ARC students about transferring, instead of just sending a flyer. “It’s a great way [to get a first job], learn a skill, get collaborative. Things like that,” Schuster added. The program will be attached to the class Work Experience 298, with a portion of positions paid and others not. Design currently shares space with Engineering and uses its two back rooms for their hardware—one for all of their 3-D printers and models that are almost always working, and one for machines that they’re repairing. 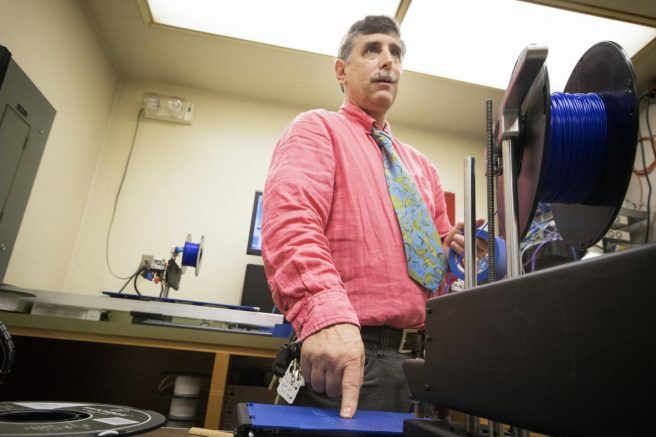 The Makerspace grant, however, requires that the area established for work be at least 700 square ft.
“We hope—hope—when the STEM building is done, to repurpose room 310,” Schuster said. According to him, their current space meets the requirement for the grant and has allowed them to work. “We’re more than a simple makerspace. You can imagine—UC Berkeley is interested enough [in what we’re doing] that they’ve invited our professor to go to a workshop in November and present. [Him and] three of our interns,” he said. Be the first to comment on "ARC to use grant money to open makerspace"